It’s a blog hop challenge! I’ve taken the plunge and started my very own blogging challenge and it provides an opportunity for us to share and celebrate the good stuff. This world of special needs and disabilities has many rocky roads, we will find ourselves on many rollercoasters along the way. But, there are a lot of positives. Through our adventures so far, we have met a lot of amazing, supportive people. It has made us stronger. We have learned to look at the world through new, wider eyes and find ourselves celebrating what to others may seem such a small achievement but to us, it’s the world. It’s a tough world, but there is so much to celebrate. Our children. 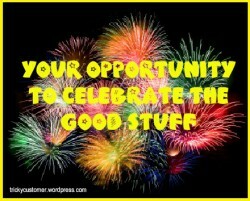 So please join me each week and post about what there is to celebrate in your world during the past week. I’m looking forward to reading your posts and celebrating with you. You can read mine here where you can also find out about how to add a link to your celebration blog post. To make sure that all the posts entered get as many views as possible, do try and link back to this post or duplicate the linky in your post and once you’ve done that make sure you tweet about it using #celebratebloghop . Don’t forget to grab the badge below and add it to your blog too!